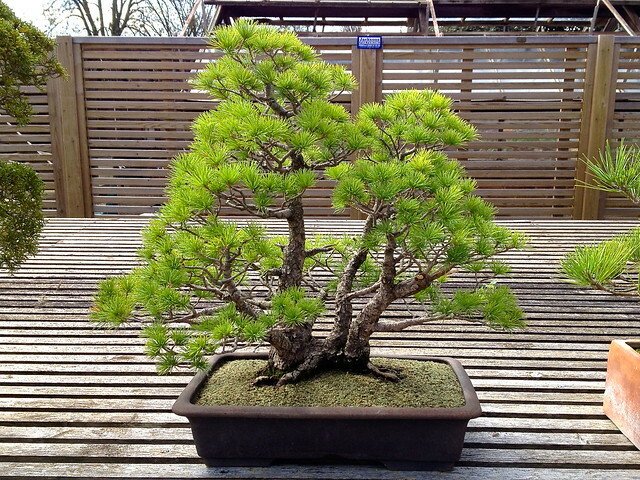 Once again the Japan Society came up trumps with a great trip to Kew Gardens to learn about bonsai. And again I have to make a confession – though I’ve been to Kew a lot and was sure I’d seen all the Japanese stuff there (Chokushi Mon, Minka House, Japanese Landscape Garden – done!) I’ve never been to look at the bonsai. I do have an excuse – they’re in a little glasshouse tucked away in a corner of the gardens. 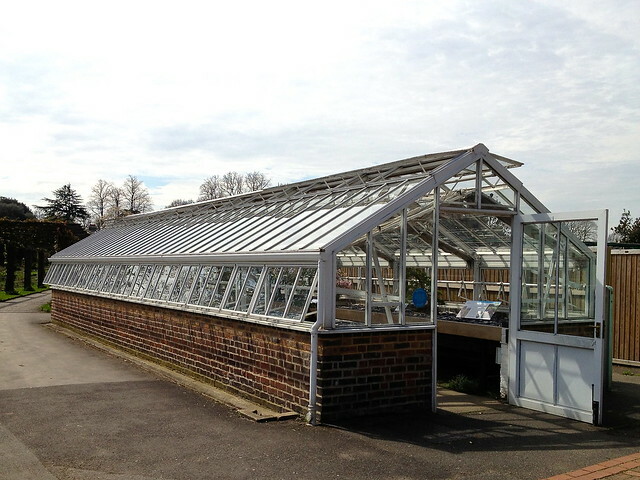 If you’re planning to go, head towards the Princess of Wales Conservatory, and you’ll find the bonsai house between the Davies Alpine House and the student vegetable plots. 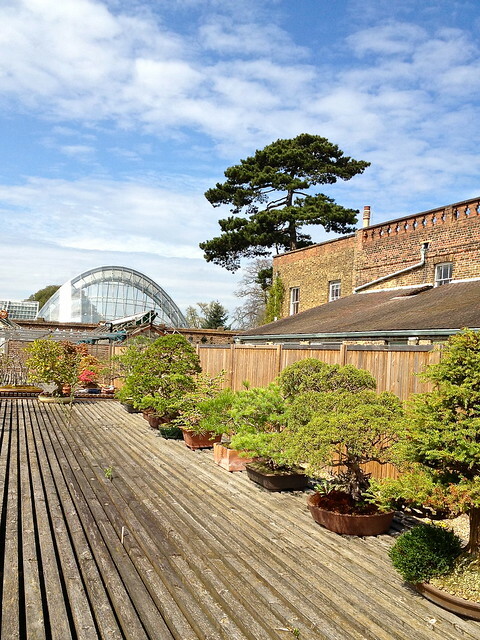 The bonsai collection at Kew began with a donation by Ruth Stafford-Jones who, over a period of thirty-seven years, built up the finest bonsai collection in Europe. They’re very valuable so don’t touch – you might set off the alarms! This Hall crab apple is around fifty years old. 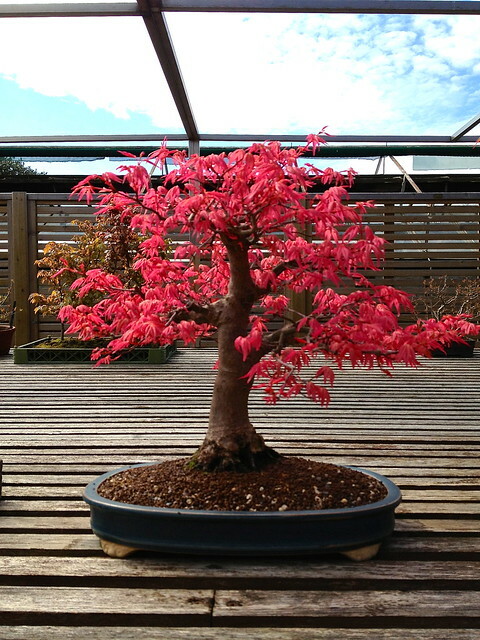 Although bonsai trees are tiny, their flowers and fruit are full-sized. 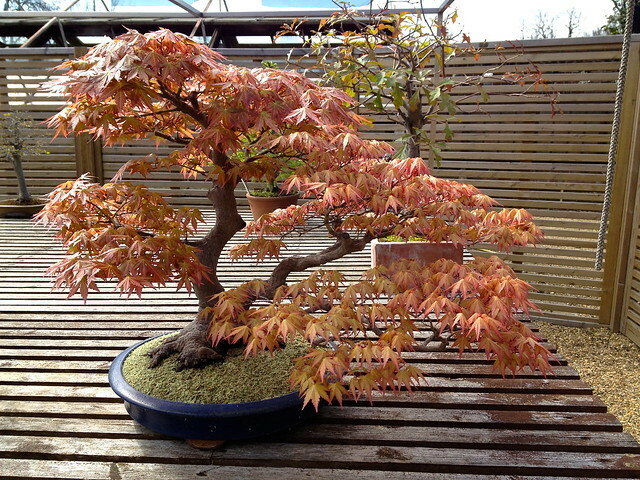 The most common bonsai trees are maples and pines. The advantage of going with the Japan Society was that, not only did we get breakfast in the Orangery, we were also shown round by Richard Kernick, the Kew Gardener who looks after the bonsai, and saw the private area where he works and keeps many more plants than are on public display. I was pretty ignorant about bonsai before this trip. I knew they were real trees, kept small by constant pruning. But I didn’t realise that just taking them out of the pot and chopping off a few roots occasionally wouldn’t be enough. Richard explained that the pruning was designed to remove thick roots that took more energy to maintain than the nutrients they absorbed provided (though he kept thick roots on the surface for aesthetic effect) and also long roots that curled round the pot. The aim was fine roots with lots of filaments to get plenty of nutrition to the plant. 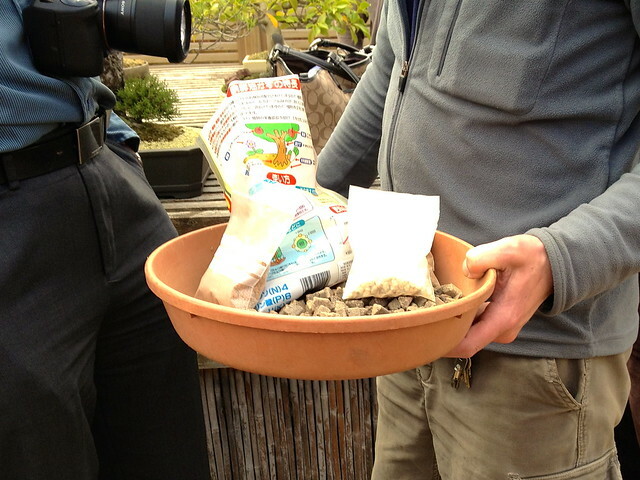 Richard showed us the fertilisers he used – most imported from Japan and far from cheap, though he gets pumice in the UK. The main imported one is Acadama (red ball) which he sieves out into three groups; large, medium and fine grain which is used for seedlings and cuttings. 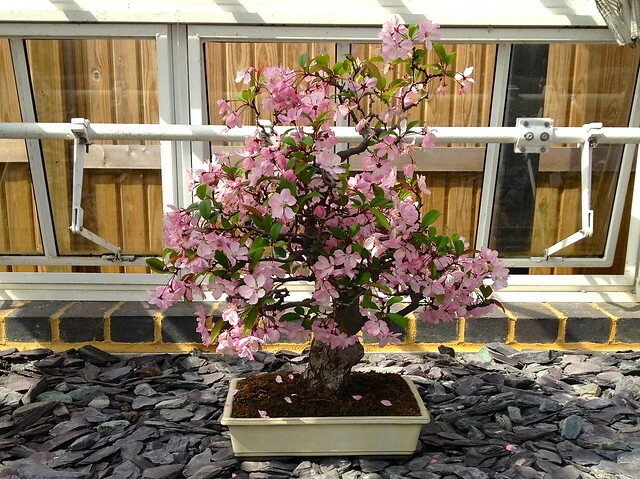 Bonsai trees are ordinary trees that have been deliberately kept small – if you plant bonsai trees out and give them room to grow, they will turn back into normal size trees. They need plenty of water – Richard soaks the pot to drive out air the roots have exhausted and allow fresh air to be drawn into the pot. Bonsai need to be re-potted every few years to give them fresh soil to replace the minerals and nutrients they’ve used up. And they need pruning regularly otherwise the roots build up and the plant gradually rises out of the pot. 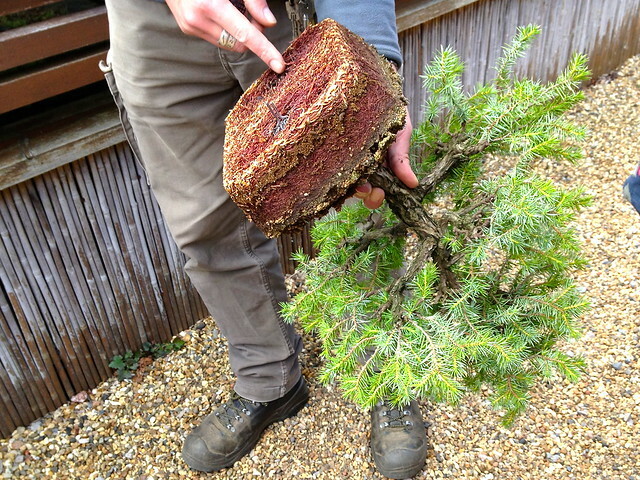 He also showed us good and bad bonsai pots. Good bonsai pots have drainage holes in the corners, so you can tilt the pot and all the water will drain out, and straight sides. Curved sides make it hard to get the tree out for pruning. The most interesting thing Richard told us was in answer to a question about bonsai styles. He said that in the west people tend to be concerned about pruning their bonsai into certain styles, whereas in Japan they look at the shape of the bonsai and then describe it as being a certain style. ‘In Japan the tree comes first and the style comes after,’ he said. Food for thought. 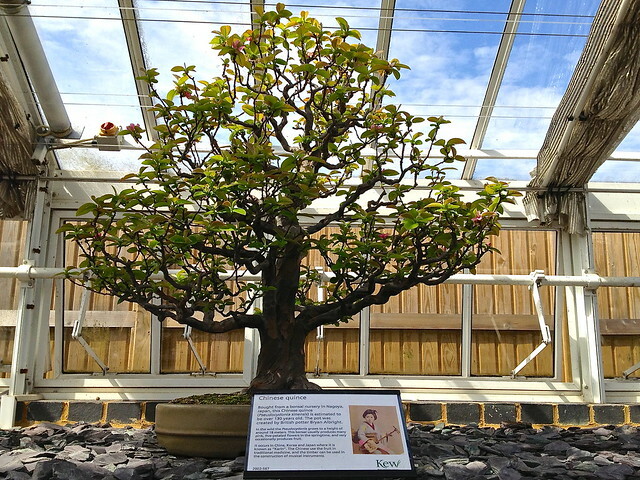 This entry was posted in Kew Gardens and tagged Akadama, bonsai, Japan Society, London, nature, plants, Richard Kernick, Ruth Stafford-Jones by Fran. Bookmark the permalink. Thank you – it would be nice if Kew marked them more prominently on its map so more people went to see them – but i suppose the bonsai house is too small to hold a lot of people. I have always loved the bonsai trees, they are so beautiful and in many ways mysterious. I love the photos and now I know more about how they are done and maintained. I like the Japanese idea of seeing what the tree is and then seeing the style. I learned so much from your post and will keep that on my list of places to go the next time I am in London. Going with a group often includes special parts regular visitors don’t see or experience. I’m glad you liked the post. The Japan Society does some great visits – I often blog about them. Isn’t it fascinating how they keep the same shape as a fully grown tree even though they are quite tiny? Beautiful! Yes – isn’t it strange! And they take just as long to grow as a full-sized tree too. Another great place to check out in London! The cherry blossoms in Vancouver are amazing as well, so being there might feel like home. Kew’s a wonderful place to spend the day – it’s so big you never get to the end of it. 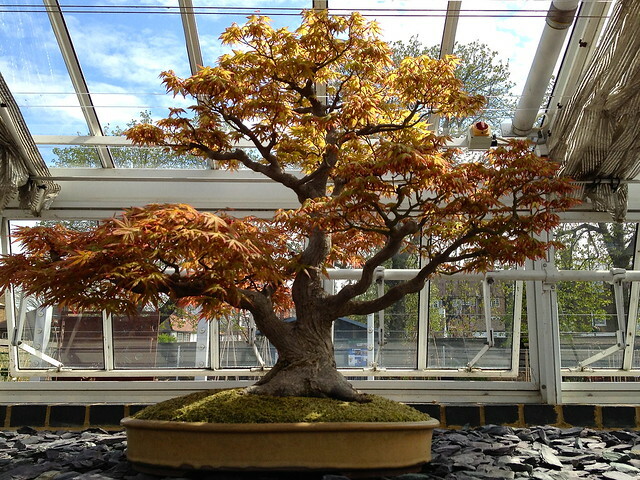 Very interesting post with a nice straightforward description of the various aspects of bonsai trees. Some good photos of some quite fine looking trees too. 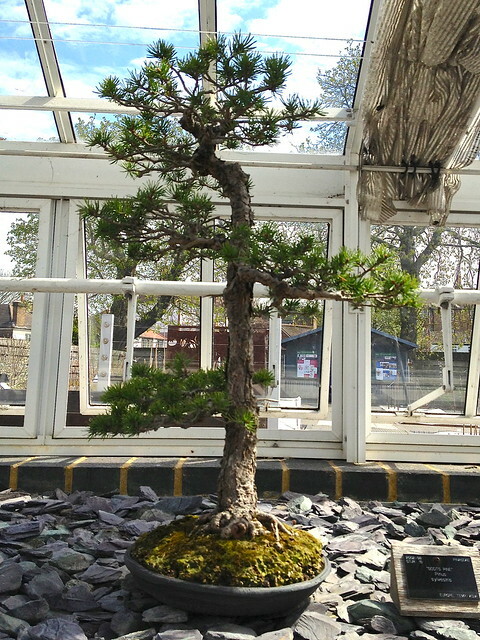 A fascinating tour of the bonsai section of Kew.